The long-braising tenderizes this inexpensive cut of meat and cooks the flavours of the olives, onions and raisins into every bite. Use also this recipe for beef short ribs and use six short ribs but omit the cumin, kosher salt and pepper rub, and halve the amount of tomato juice and red wine. Or just add one cup of beef broth. In a large oven-proof pot with a lid, heat oil over medium-high heat until hot, but not smoking. Pat meat dry with paper towels. Rub roast all over with the cumin, salt and pepper. Place roast in pot and brown on all sides for about 10 minutes per side. Combine tomato juice and red wine. When meat is browned, removed meat from pot. Add enough of the juice-wine mixture to fill the pan halfway. Add olives, onions and raisins. Bring sauce to a simmer, scraping browned bits from bottom of pan. Skim and discard any foam that forms on top of sauce. Return roast to pot. Cover with lid and cook in the oven for about 1-1/2 to 2 hours or until meat is very tender. When meat is done, remove pot from the oven. Remove meat from pot. Tent meat loosely with aluminum foil and allow to rest 10 minutes. Meanwhile, set pot of sauce on stove on high heat, and reduce sauce to desired thickness. Season. 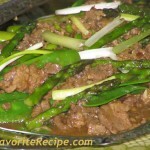 Cut meat into thick slices and serve with reduced braising sauce. Have You Tried These Other Recipe Ideas?